Posted on December 12, 2014 by Ronald Patrick Raab, C.S.C. In last month’s column, I wrote about my early years of priesthood ministering among people with HIV/AIDS. The stories of some of the mothers of young men who stood by the suffering, confusion and pain of their sons taught me lessons in holiness. I was called to the hospital to anoint a man in his late twenties who was dying. I was told that his parents were traveling from another state to be at his side. The exhausted parents entered his room after I had just anointed their son. He was extremely close to death. The elderly father sat down next to his son. The mother, fifteen years younger than her husband entered the room wired and angry. Her anger filled the room. I quickly escorted them into a room nearby to try to calm them. The mother told me that she was not angry that her son was dying or that he was dying of AIDS. She told me that she was angry because her parish priest had told her not to come to the bedside of her dying son because he said the young man was going to hell anyway. I sat for hours with the family during that week. I tried to calm them. The voices of the women in the family became strong and healing again. The women rallied against the bitterness and homophobia that harmed them. At the end of the week, we buried her son on my birthday in an atmosphere of peace and honesty that I seldom experience at funerals. For many years afterward, I received a birthday card from her. Her appreciation and love extended to her family and me until she died. I will never forget her initial tears and her many years of gratitude. Another mother called me to come to her home to anoint her son. She met me at the screen door. The house was cluttered and very dark. Her son was dying in the first floor bedroom. I walked in and knelt at the bedside. I held his hand and prayed in a low voice. She stood next to the bed on the other side. We all prayed, read scripture and I anointed him. She escorted me back to the screen door and the light streamed in to the dark living room. She cried in my arms. She looked up into my face and told me that she was so surprised that I touched her son’s hand. She whispered through her tears that no one had ever touched her son in his disease. I still see her in my heart when I visit people who are seriously ill.
A mother from a wealthy parish came to speak with me. Her story about her ill son seemed aloof and distant. She did not know how I would receive her or the news of her dying son. I met him and we all prayed. We buried him in the love and consolation of his mother. Every year I receive a note or email from her requesting that I offer Mass on his anniversary of death. After all these years, I still read about her life and her memories of her son who died way too soon. I will never forget that day of his burial and her response to her only boy. Her tears are etched in my ministry. I recall these holy women as I reflect on the gospels for the Lenten season (Cycle A). The Woman at the Well became a human vessel for the message of hope that Jesus carried with him. Her soul was parched by her experiences of her past. Her head was bowed to the ground by the weight of her sin and her insecurity that her life would ever be different. In a life changing exchange, Jesus and the woman came face to face in their thirst. She realized that he is the wellspring that she had been looking for. Jesus was the source of grace. Her soul soaked up the encounter and healing flowed deep within her. She left the holy scene believing in the voice of Jesus. The encounter brought her back to real life. She found her voice admitting her suffering. Her voice then flowed generously as she went back to her village to tell everyone what she had experienced. She mothered her village into a deep belief that consolation and love existed for every person. These women stood in the promise of Jesus’ Paschal Mystery in moments of forgiveness and new life. Their witness still speaks to all believers. We all come to believe through these holy women in scripture and the holy mothers who waited for healing and hope at the bedsides of their sons. 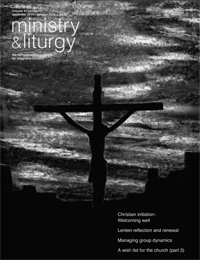 This entry was posted in Blog Posts, Ministry & Liturgy Magazine by Ronald Patrick Raab, C.S.C.. Bookmark the permalink. Beautiful meditation on true love and acceptance that is only possible through Christ’s love. Thank you for approaching this world in all its ugliness with such a beautiful, loving hand.